This report tells you how students answered each question on your test. The single table can be run to reflect performance of a district, site, teacher, or class period. This report indicates, by list of students, how each student did on the exam. This is also the ONLY place you can delete individual student scores for an assessment. 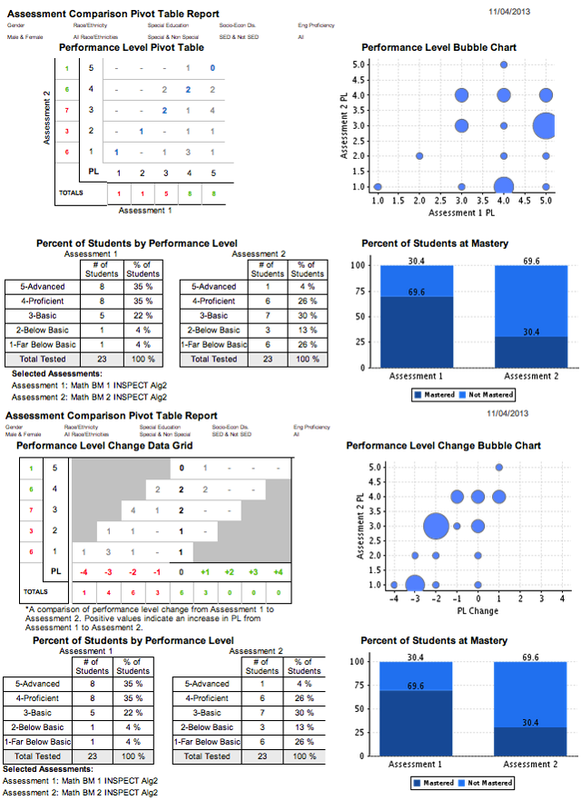 The data is reported by student in alphabetical order with grade level, version, date taken, number correct, number possible, percent correct, and performance band. 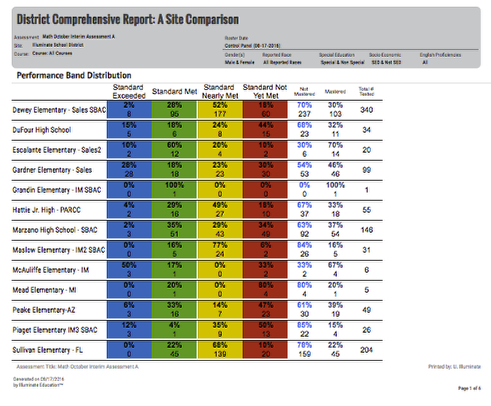 This report shows you how students, teachers, or sites performed on the test and in relation to one another. 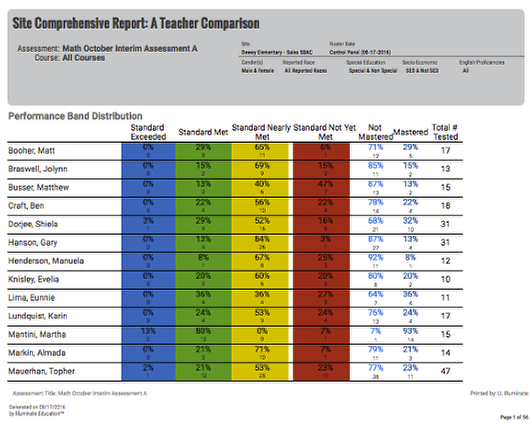 This report shows you how the entire site's worth of teachers performed on the test and in relation to one another. By a list of teachers. 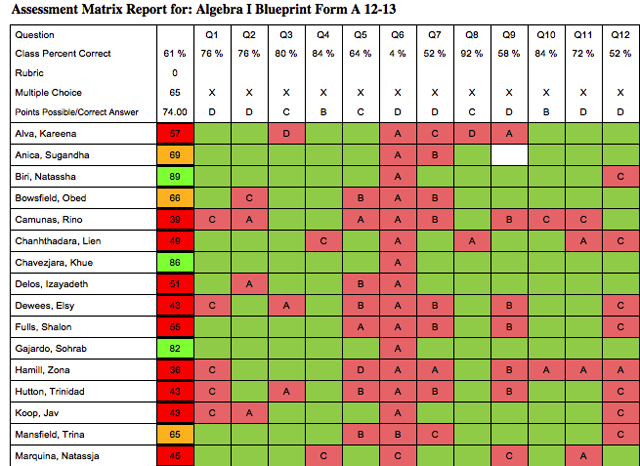 This report shows you how an entire class performed on the test and in relation to one another. 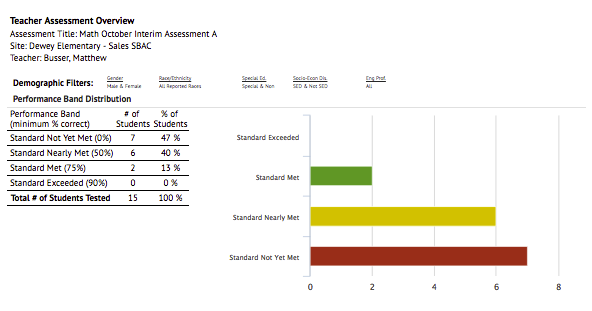 This report communicates to a student or parent how 1 student performed on 1 test. 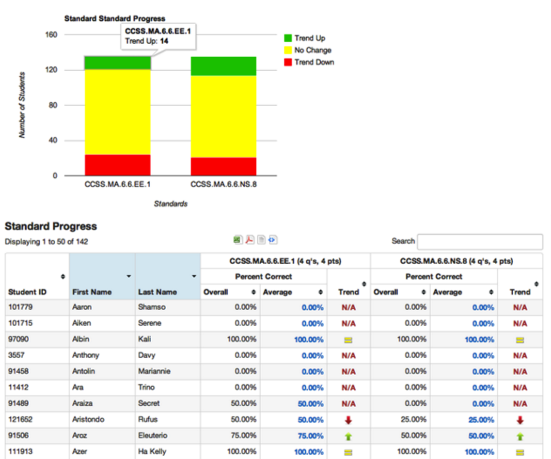 Each student has his or her own page, though you can generate reports for every student in a class period simultaneously. Also, the letter and its standards can be displayed in English or Spanish. This report allows you to save paper by printing “mini reports” for multiple students on the same sheet of paper, which you can then cut to distribute. You can generate the report for a single student, but the real magic happens when you generate the report for an entire section. Multiple students are featured per page (usually 10 students per page if you don’t include standards) in a way that allows for easy cutting, so you can give each student his or her slip. Also, the slips and their standards can be displayed in English or Spanish. This report provides statistics on a test’s composition and results. A single table of statistics can be run for the test as a whole or broken down by item/question #. 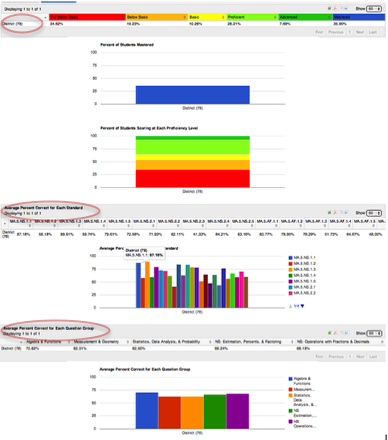 This report gives a basic summary of a site's performance on a test. The overview is run for a whole site. Results are tabled and graphed. 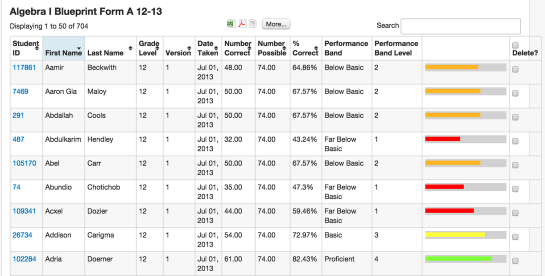 This report gives a basic summary of a teacher's classes overall or a specific period's performance on a test. The overview is run for a teacher's classes overall or for a single class period. Results are tabled and graphed. 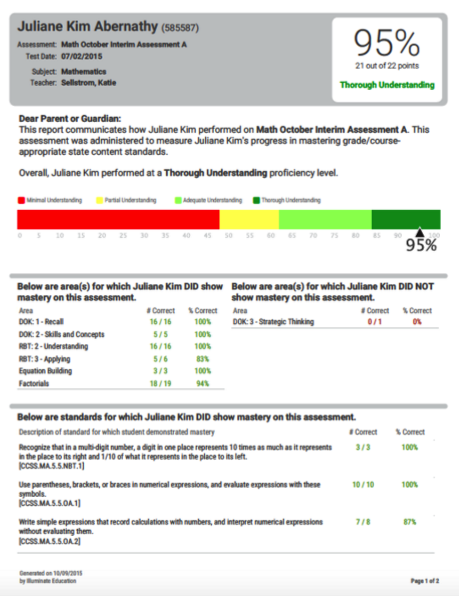 This report gives a basic summary of a student's overall performance on a test. 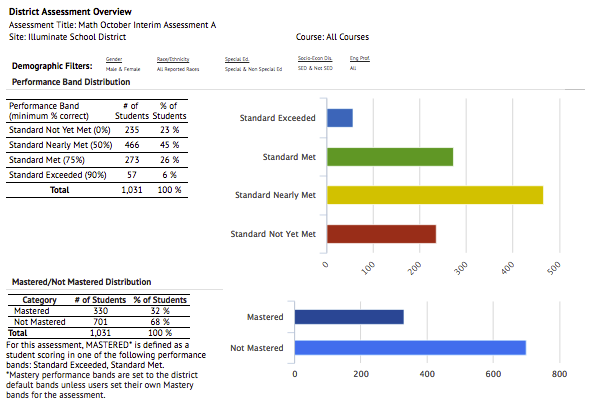 The overview is run for a class period and each student is reported on a separate page. 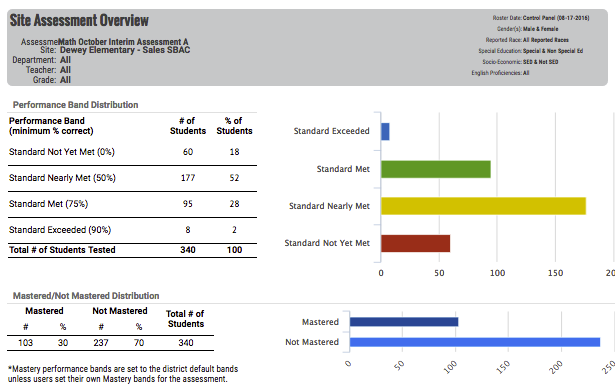 This report gives a summary of individual students' overall score, performance level, and percentage with color coding. The report may be run for the whole district, a school site, a department, a teacher, a course (or a course for a specific teacher), or a class period. 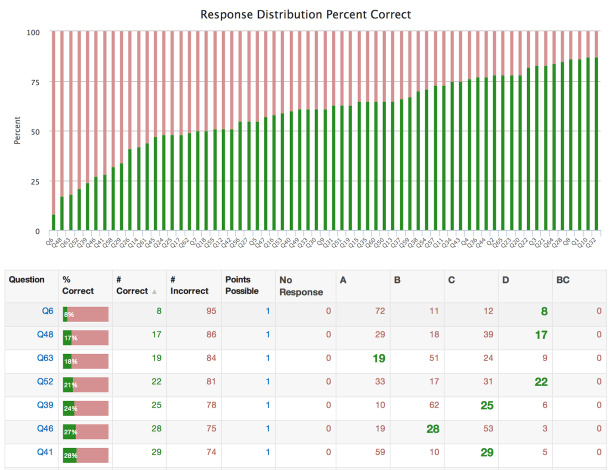 Results are tabled and graphed. 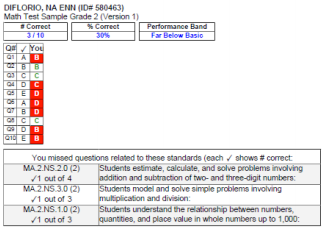 This report gives a summary of a group of students' scores, performance level, and answer choice with color coding for every question on an assessment. 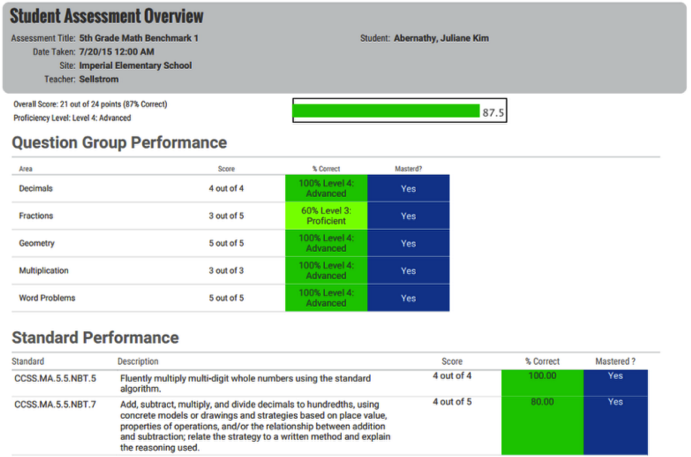 The report displays question, class percentage, multiple choice, correct answer, and then each student's score, performance level, and answer choice for each question.